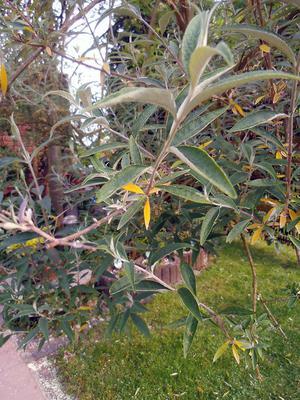 Last year the leaves on my buddleia started to turn yellow. This didn´t prevent it from blooming profusely but I still thought it might be lacking nutrients. However, this year, despite the addition of compost and mulch, the same problem has occurred. It´s in a sunny position and is well watered. I´d appreciate your advice as to the possible cause and solution. From the picture, it's mostly the older leaves lower down on the stem right? I think this is a nutrient issue, but don't just put more fertilizer on. It may be beneficial to sprinkle dolomite lime around the base of the plant. What this does is change the pH of the soil over time. So then the nutrients in the compost will be bio-available. It's sort of like you taking a probiotic or enzymes to help digest your food. Same thing here. If the pH of the soil is too acidic, the micro herd will not be able to help reduce the nutrients into useable form for the plant to use. Be patient; this solution could take a few months or even into next season to completely fix the problem, but you should see results fairly quickly. Thank you for your advice. By sheer coincidence I found a huge bag of lime in the garden shed which turned out to be exactly the kind you recommended. I suppose I'll have to wait patiently for results but I'm glad there was something I could do even if it won't show an immediate effect. At least it isn't BUGS I have to deal with! I can't guarantee that the plant doesn't have some kind of bugs on it, but the type of symptoms it's showing lead me to think it's nutrient absorption more than anything. Let me know if it helps!